When we started getting away from processed foods, a friend shared her clean eating coffee cake recipe with me. I was thrilled to have a breakfast recipe that used honey because I wasn’t as familiar baking with it. I’ve since changed up the recipe she shared with me and am now sharing it with you. 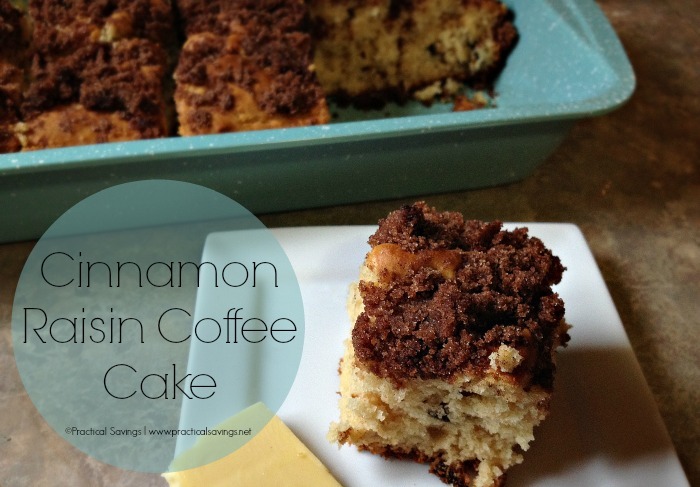 My kids really truly love this coffee cake. It’s light and when served warm with butter, it’s just heavenly. I’m sure it would be just as good to omit the raisins and cinnamon and add some fresh or frozen strawberries or blueberries for a different twist. This one also cooks comparatively fast (25 minutes) instead of the 50+ minutes that some coffee cakes require. If you can’t afford the whole wheat pastry flour or the honey, try it with just regular flour and sugar. There have been times when I’ve had to do that and it turns out just fine. It’s just no longer considered “clean”. Pre-heat oven to 375 degrees and grease a 9x13 pan. Cream honey, butter and eggs together in a large bowl. Add in orange juice or milk (I use Almond milk). In a separate bowl, sift flour, baking powder and salt. Combine the dry mixture to the wet mixture and mix until combined. Fold in raisins. For topping, melt butter. While butter is melting, combine the rest of the ingredients and stir. Add in melted butter. Spread batter in pan and add topping. **The pan pictured is from Good Cook’s Sprinkles line which was available for a limited time. I found it at my local Grocery Outlet store.